It was a Thursday night, the 20th of December 2012. We were preparing to go out of town to the grandkids house the next morning. However, one of the presents didn’t make it via FedEx in time and I was arranging with my neighbor to pick it up and hide it on my porch in a plastic trash bag. After hanging up the phone, I went outside to put the trash bag on the patio table. Out of the corner of my eye, I noticed flickering yellow at the house across the creek. When I looked up, the entire south end of the house was engulfed in flames. There was a car parked in the driveway, making me think someone was home. I frantically ran into the house yelling to my husband, “the house next door is on fire!!! !” He ran to the door, yelling back, “Call 911”. There were no firetrucks present yet, no sirens screaming their way towards the house. I called and was transferred to the fire department and told that the firemen were already on their way. Our neighborhood has no fire hydrants. It took the trucks another 15 minutes to get there. By that time, flames were shooting skyward out all of the doors and windows and black rolls of smoke were racing across the sky to the west. One by one the pumper trucks came. They lined the street – at least 8 trucks and 3 ambulances. As if in slow motion, the firemen gradually rolled out their hoses and started spraying the fire. Neighbors gathered to worry about the resident’s of the house. No one knew if they were in there or not, 2 adults and a 7 year old girl (and two dogs). Hours later, we saw a stretcher being taken in to the house and brought out with one occupant. Even later another stretcher bore yet another person out and to an ambulance. The firemen on the scene told us that no one was in the house, but we worried. The fire was put out, leaving an empty shell of the interior. Birds fly in and out now. Later the next day we found that the stretchers bore injured firemen, one falling when the floor collapsed and the other having slipped on the icy steps into the house. The family and dogs had not been home. Thankfully, the firemen were not seriously injured either. How Does One Recover From Such A Devastating Event? A person hears about house fires all the time, but never imagines that they will have their own house burn. It is mind boggling to think about. Really, all you have left, if you are lucky enough not to be home, are the clothes on your back and the things you had with you when you left to run that errand, go on that visit or go to work. No pajamas, no pots and pans, no toothbrush, no spare pare of shoes, no shampoo or hair dryer, nothing. Nothing left at all. I can’t even imagine losing all of my family pictures, collections, family heirlooms, and important paperwork. How Does One Even Comfort A Neighbour Who Has Just Suffered This Kind Of Loss? We don’t know those neighbors very well, don’t know their cell phone numbers or how to contact them. How does a person extend empathy in these types of situation? I mailed a letter to them – hopefully they received it. What Can You Even Do To Help Them Through The Situation? At the Life After the Fire blog, Brooke clues us in on what a fire victim really might want – things like knowing someone cares, asking the person what they need (maybe help sorting through things, maybe some moral support in dealing with all the things that have to be done, or perhaps watching their pets while they are stuck in a motel), gift cards to help them buy needed things or restaurant cards (because they have no where to cook). Find Temporary Shelter For You And Yours (including pets). If you don’t have someone you can stay with or can’t find or afford a motel, contact the Red Cross (you can get with the local fire station to see how). Ask your fire department if they have a checklist you can follow, similar to this one from The Prairie du Chien Fire Department. Don’t Re-Enter Your Home Until Cleared By The Fire Department. Loop In Your Insurance Agent. Don’t touch a thing or start any recovery activities until your insurance agent has been contacted (assuming you have home insurance). They will probably want to come out and look at it before you do anything. Take pictures when you finally do go to view the house, before you do or move anything. Your insurance agent should be able to help you figure out what to do right away – you might need to board up holes to keep further damage from happening. Let the mortgage company know about the fire. Track your fire related expenses. Forward your mail if need be. Start Replacing Important Documents That Were Destroyed. Social security cards, birth certificates, income tax records, safety deposit box keys, drivers licenses and etc. Work With The Insurance Company To Figure Out What To Do Next. You may need to haggle with them over what was covered or not. You need to fully understand what will be covered and what won’t be – before you start contracting for cleaning and repair services. If you have pictures of your possessions taken before the fire, use them. Understand That Dealing With Loss Takes Time. You will be angry, you will grieve the loss of your things, you will have your life interrupted for months or years. It will take time to rebuild, recover and find your new normal life. Have you dealt with a home fire? What would you add? Good post! Thankfully we never have. My wife used to volunteer with an organization here that would go to home fires after the fire department was on the scene. They would go there and offer much of the care you listed. They would get them set up in a hotel for the next week and arrange for them to be able to get food as well as basic necessities. It was always sad to hear many of the stories, but am glad she was able to help them meet some of their immediate needs. Sounds like a worthy organization. Is it nationwide? I can’t even begin to imagine losing everything in a fire. I would be devastated. I can only imagine that it would take a long time to adjust. Hopefully your neighbors have a place to stay and friends and family they can count on to help out. That’s just an awful story. Yes they do, thanks! I think we all should stop and think about what things we would need to access and try to find a way to have an offsite copy. 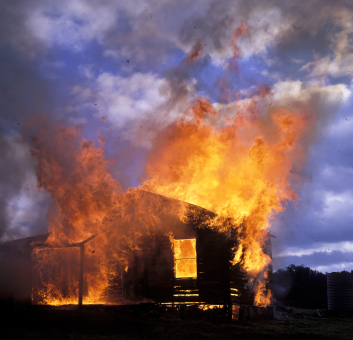 I need to really speed up the family history photo and document scanning – it would all be lost if our house burned. Years ago, my neighbor and I (we lived in a quadraplex at the time) stopped a fire and saved a life (and our stuff too!) by pounding on a resident’s door, waking him up and getting him to put out the fire in his bed caused by a lit cigarette he had dropped when he nodded off. So, yes, it is valid to be nervous. Ask your landlord or association (if you own) what fire prevention methods are being taken. Thankfully I never had to deal with that but having a thatched roof now makes it a permanent possibility. All my important documents are scanned in case I can’t recover the paper version, getting new ones will be easier. You are wise, wish I had all of mine done. It’s times like this though that brings out the best in us all. It is an opportunity to help and get to know the people involved, look after kids, find that spare bed, table or whatever to lend or give them, and that kindness will be repaid a million times over not only by the family but by others. I have never had to deal with this and I hope I never do. I hope you never do either. But, it is wise to think about and prep for, just in case – don’t you think? We have some really good friends that this happened too – their friends and neighbors have given to them generously in many ways. One specific thing that they really appreciated was a ‘Christmas Shower’ that was thrown for them. Their house burned before the holidays and they got much needed Christmas decorations, ornaments and such. They still talk about how much that meant to them! Thanks for the tip. Hope your friends have since recovered from the event. I know! My Dad made me keep a rope ladder in my dorm room when I was at college – in case of a fire. At the time I thought it was so lame, but if something had happened I would have used it in a flash! “Find Temporary Shelter For You And Yours (including pets). So much to do and think about after something like this and no matter how much you prepare, you aren’t prepared.